Pastor Elie Buconyori left his homeland of Burundi for Bible college in Kenya. Following graduation he was offered a job in Christian literature development. Along with other Free Methodists working or studying in Kenya, a Free Methodist home fellowship was started with Pastor Buconyori as their leader. The influx of experienced leadership from Burundi and Rwanda during the crises in those countries greatly assisted the new work in Kenya. 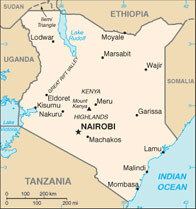 The Kenya church reached provisional general conference status in March 2009. Rev. Nixon Dingili was chosen as the bishop. The conference is comprised of two annual conferences: Trans Africa Conference, which includes the work in Uganda, and the Highlands Conference. Canadian FM missionary Debbie Hogeboom was one of those who migrated to Kenya in 1994. Since that time she has been involved in Christian Education, leadership development and coaching of church planters. Presently Debbie is based in Eldoret and giving direction to the development of Springs of Hope Bible College, the first FMC training institution in Kenya. Today the Kenya General Conference numbers almost 200 congregations. Canadian partnership involves ongoing support of Debbie’s ministry and the Bible College project. If you would like to donate to Debbie Hogeboom, click on “Donate Now.”This will take you to the Free Methodist page on the Canada Helps website, a secure site for online donations.Click on “donate now” and scroll down to Fund/Designation; highlight Global Missions.Just below you will see a box – Message/Instructions – type in clearly “Debbie Hogeboom”.